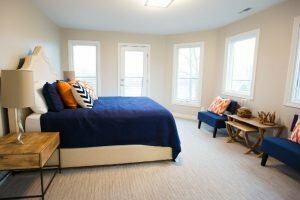 We’ve walked you through the kitchen, the bathrooms, and the lower level bars, now let’s take a look at the floors running throughout the entire house, helping to carry the color palette and design style from one room to the next. 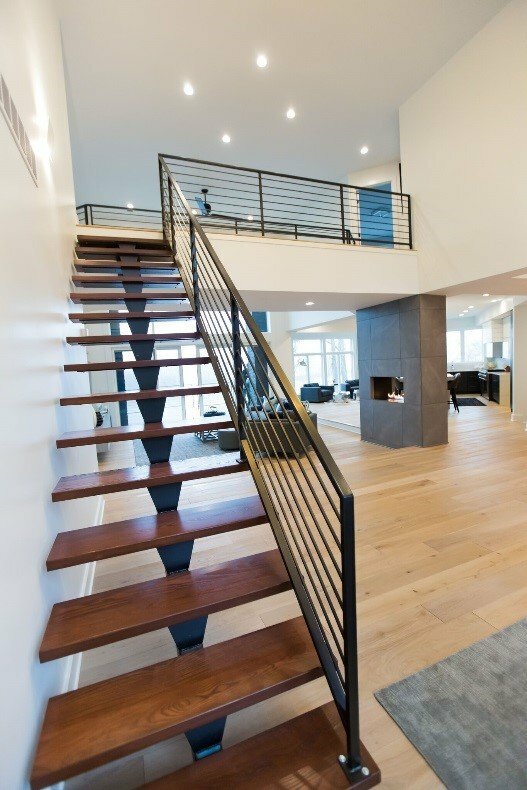 7-1/2”W engineered oil-finished oak hardwood floors in a light natural color were installed through much of the first floor, lower level, & upstairs catwalk. 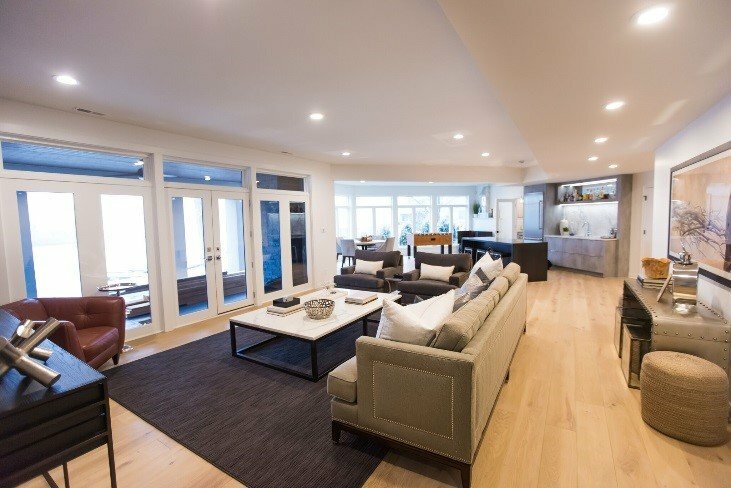 In an open concept floor plan it is typically recommended to use only one type of flooring to make one room flow seamlessly to the next creating the illusion of a large open space. By running the hardwood floors on a diagonal in the kitchen in comparison with the dining room and great room, a dynamic feel is added in the space. 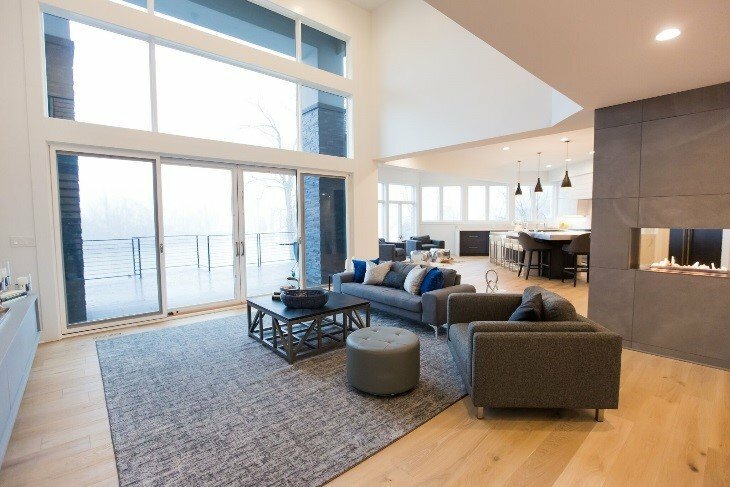 Additionally, the matte oil-finish to the floors compliment the other textures seen throughout the home making the space feel stimulating yet calming. 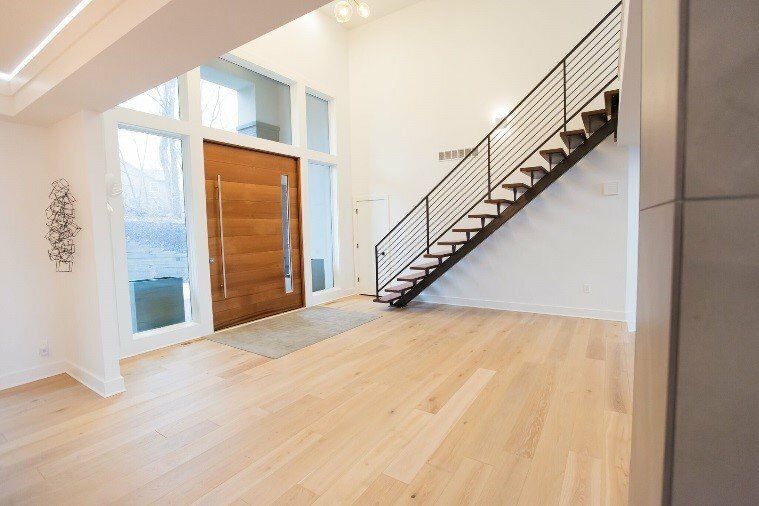 Darker stained oak treads were selected on the floating staircase and pair nicely with the oversized cedar door & metal railings. 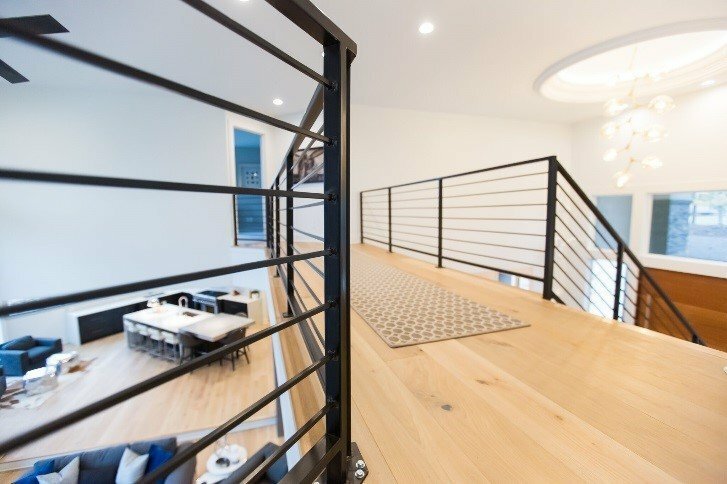 This too allows for a nice contrast with the hardwood floors, making the space feel that much more open. 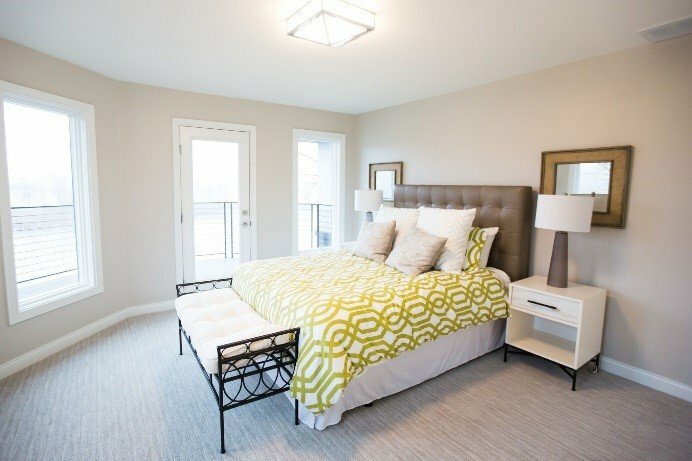 Subtle patterned carpet was used in the master bedroom as well as the secondary upstairs bedrooms to add interest to the floors. 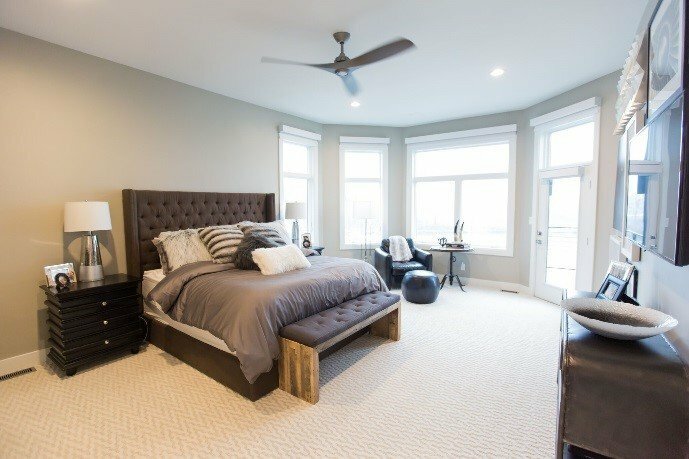 The neutral tones compliment the hardwood floors next to each room as well as keep the carpet design from feeling too busy. 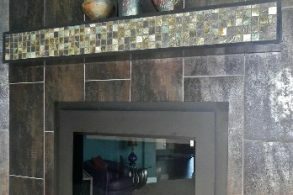 To compliment the decorative tile in the lower level bathroom, a lively pattern in deep contrasting colors was selected for the lower level living quarters. Also, used as an office, the busy pattern on the carpet adds energy to the space facilitating creativity and innovative thinking; which is perfect for our line of work. 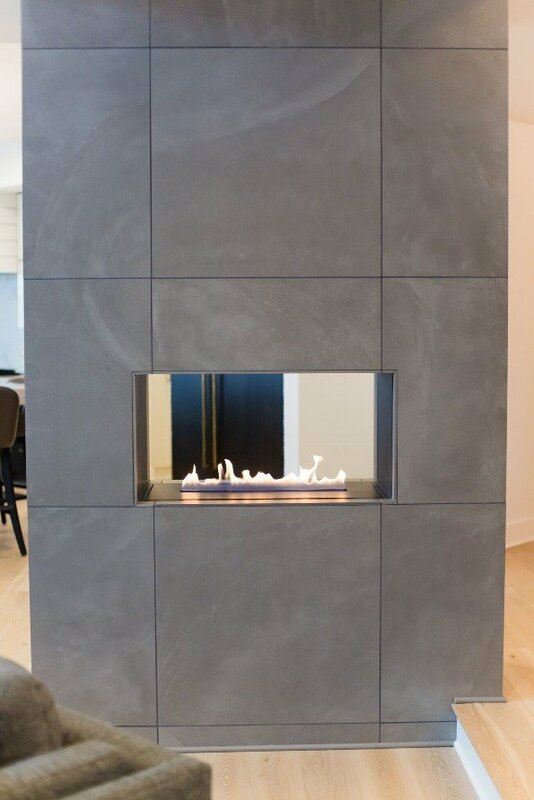 The custom Kane area rug in the great room compliments the deep stack stone wrapped around the pillars in both the front and back of the exterior of the home and compliments the large format tile installed on the centrally located fireplace. 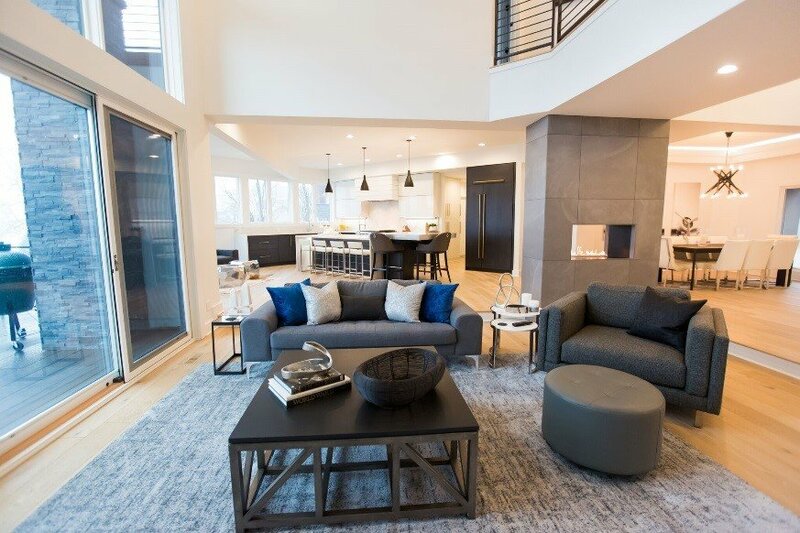 By mixing and combining multiple tones, textures, and finishes but keeping with a similar style, design, and color palette, any space can be transformed from unfavorable to unbelievable. We hope you liked the changes we’ve made, the designs we’ve created, and the innovative ideas we’ve shared. Hopefully this has inspired you to think about projects in your own home. 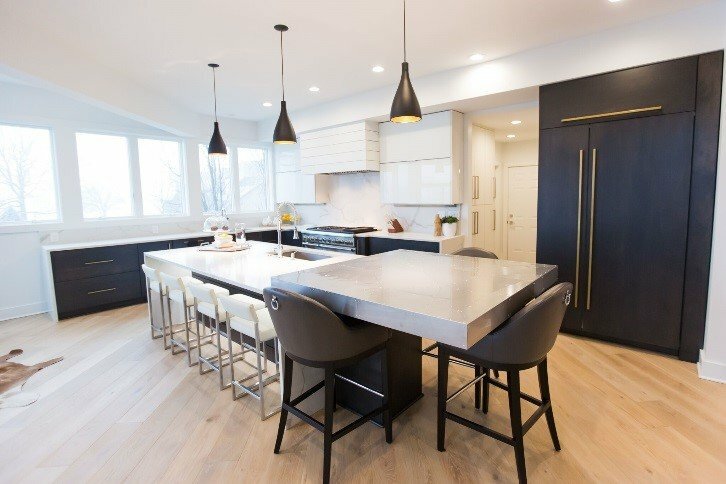 To learn more about this project or any of our other projects we have completed, or to become educated on cabinetry, countertops, flooring, and remodels, please sign up for our newsletter by clicking here. 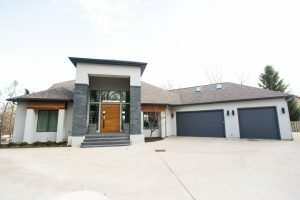 If you are interested in remodeling your home and would like to set up a consultation with one of our talented designers today, please call us at 317.575.9540 or visit our website at liveaco.com.